Starship Technologies is partnering with the Co-op in Milton Keynes to deliver groceries there. It follows trials with Just Eat to deliver takeaways in South London. The machines have a top speed of 10mph (16.1 km/h) and in busy areas are accompanied by a human minder. The firm claims none has been stolen or vandalised, with 100,000 miles of delivery journeys completed so far. The robots will be put to work in 20 university or work campuses across the UK, US and Germany, Starship said. They can travel up to three miles and are fitted with ultrasonic sensors for detecting obstacles, nine cameras, radar and GPS. Upon arrival, the recipient of the parcel receives a text message containing a link to unlock the robot. Starship told Radio 4’s You and Yours programme it can deliver 200 of the most common grocery items via robot in Milton Keynes. Milton Keynes is already earmarked as one of the UK’s testing grounds for driverless cars. “These campus environments are like robot playgrounds,” said Henry Harris-Burland, Starship’s vice president of marketing. “In Hamburg we are delivering spare parts and tools between buildings and to people’s desks. Sorting offices in some businesses are becoming overloaded as people order more personal deliveries to their workplace. 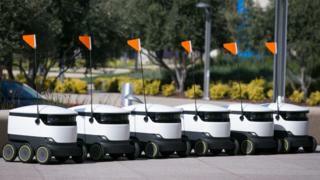 In Germany, car giant Mercedes Benz uses the robots to deliver parcels internally. However technology analyst Dean Bubley told the BBC there were still challenges to be addressed. “Letting them loose alone on public streets will be very difficult because of the unpredictability of the general public,” he said. Starship was set up by two of the co-founders of Skype in 2014. It has not said how much its current expansion will cost, but raised nearly £15m in funding last year.